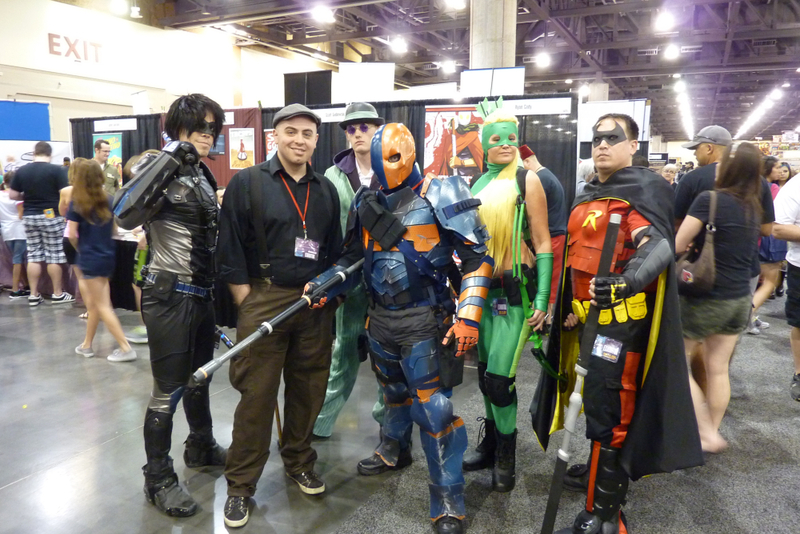 Here we have Nightwing, the Riddler, Deathstroke, Arrowette and Robin hanging out. 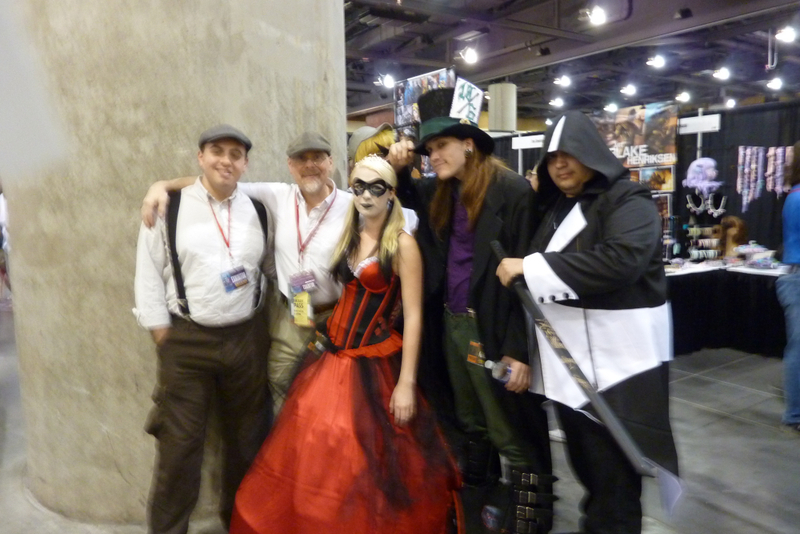 What this crew could be doing together is ominous to consider, but they looked great! Nightwing stands guard over a Gotham clock-tower. Super mega cool! 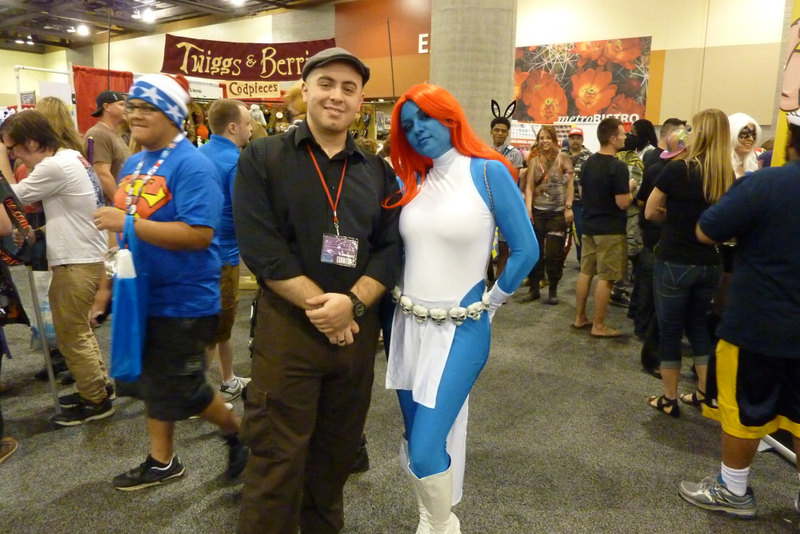 Mystique chose not to shape-shift today, and I’m glad because this costume looks great! 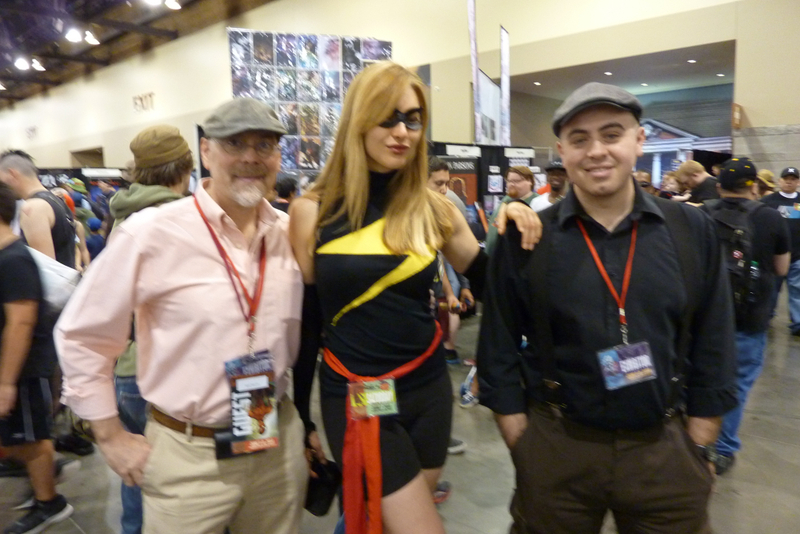 Ms. Marvel stopped by the booth. 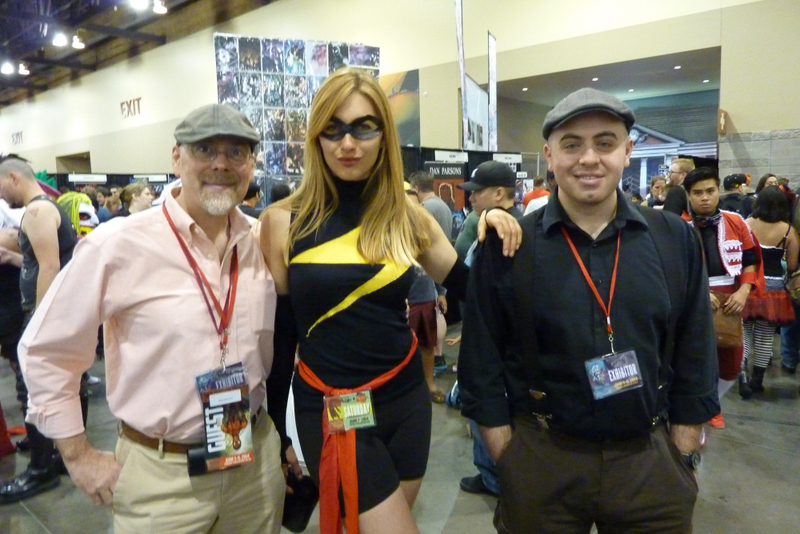 Behold the 6ft+ super-woman! 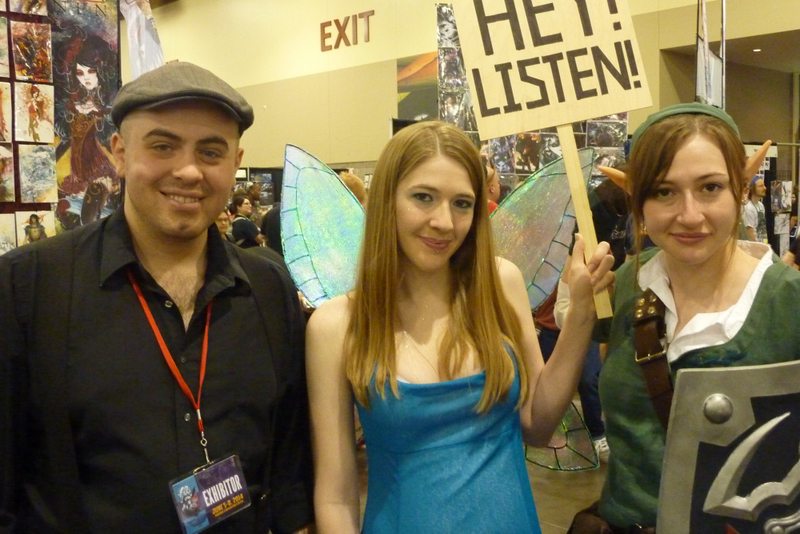 Link and Navi stopped by. Navi wanted attention, but in a good way. 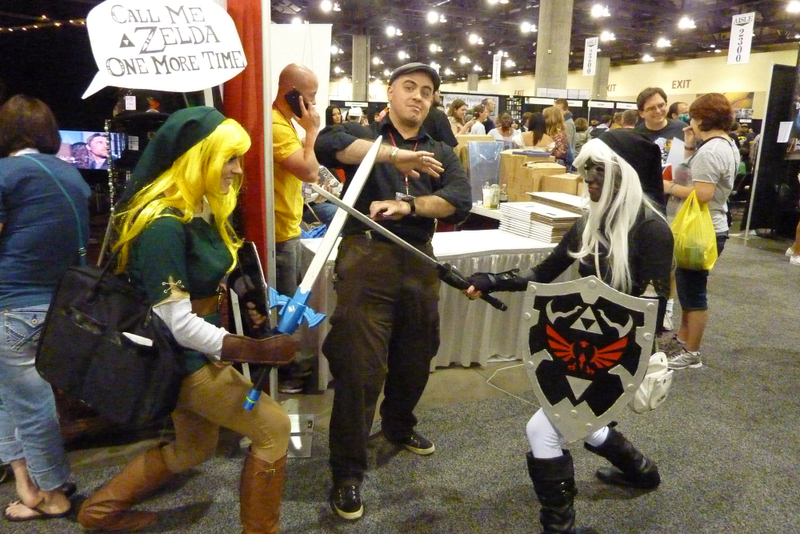 Two links face off, one a dark reflection of the other! 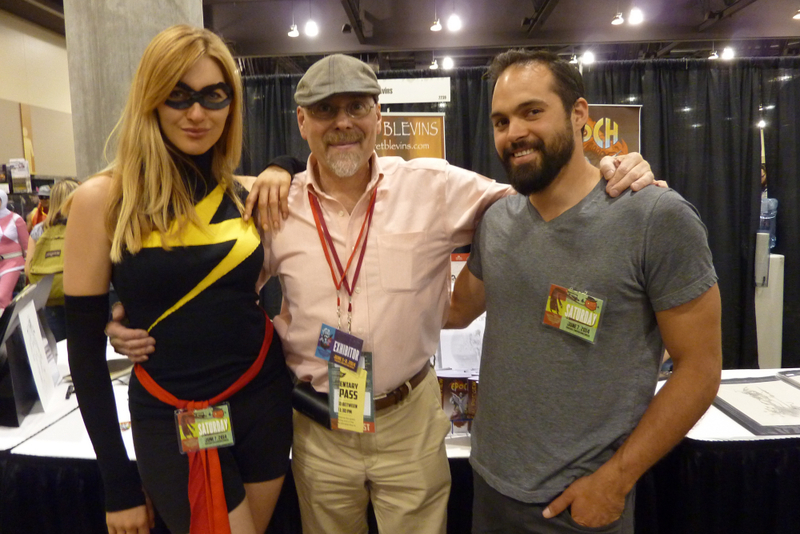 Actually, they were both very nice. I believe this gentleman (gentlecat?) 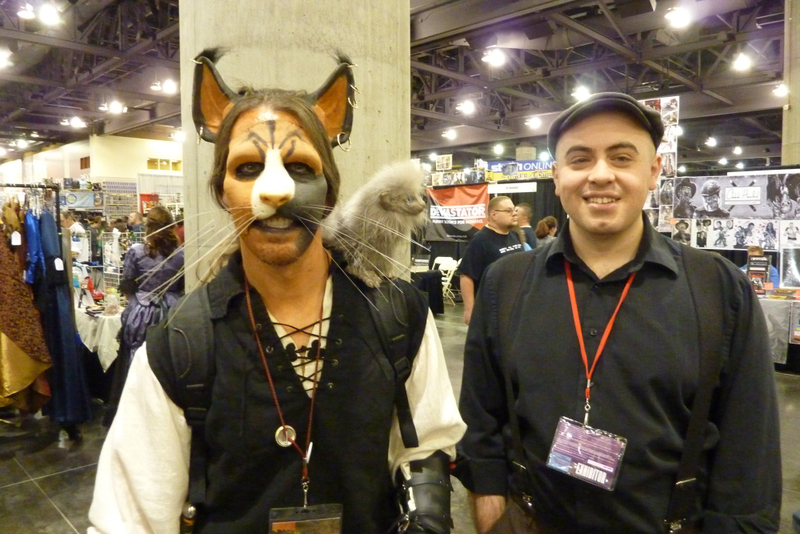 is a Khajiit from The Elder Scrolls, but I’m not sure. He looks amazing, either way. 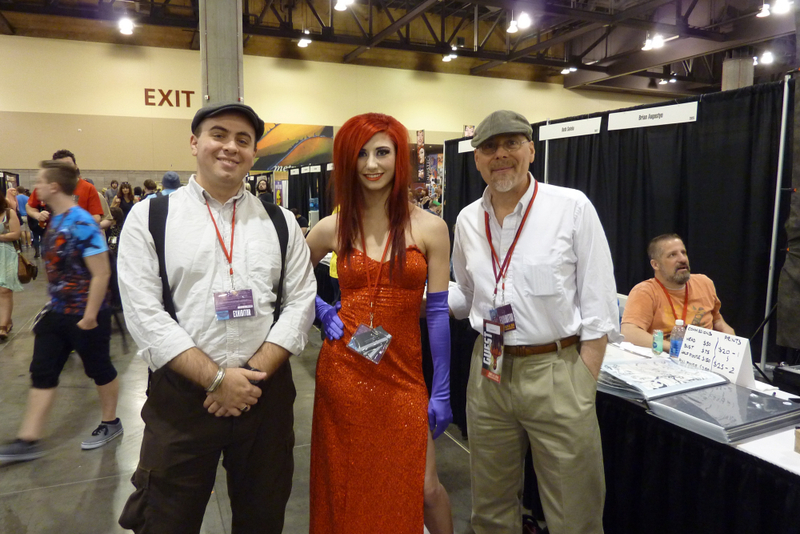 Jessica Rabbit, looking sultry. A great rendition of a classic character! 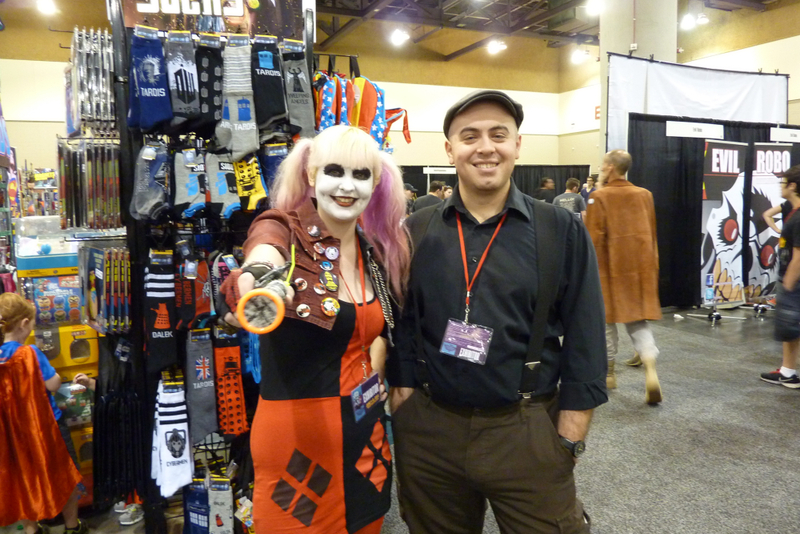 She was going to cut me with the lightsaber, but I explained that I was an exhibitor, so it was ok.
Harley Quinn looks ready to paint the town red! 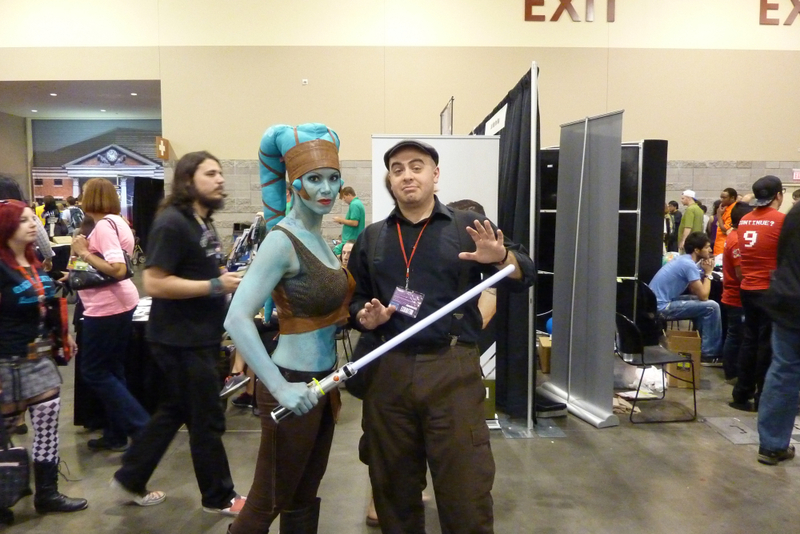 Always a good costume choice, and well-done here. 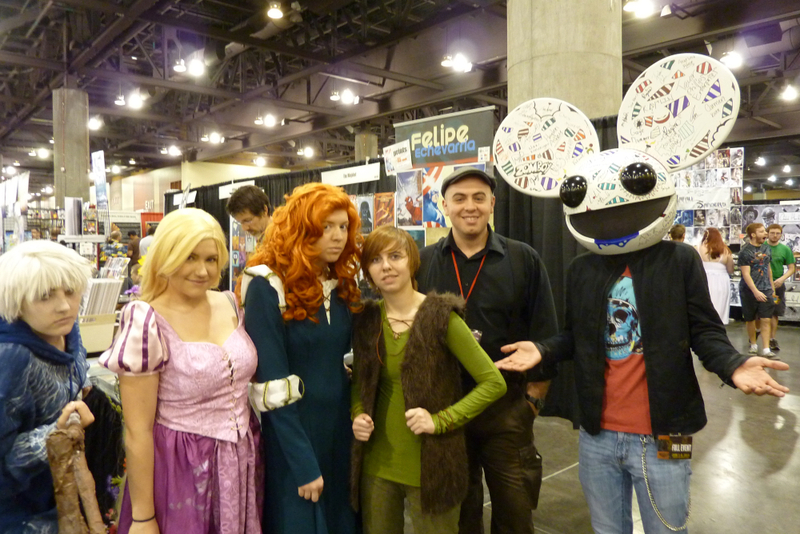 Here we have Jack Frost, Rapunzel, Merida, Hiccup and…a mouse-head type guy? They look quite picturesque together. The Ice King, keeping it cool. HA HA HA HA HA. 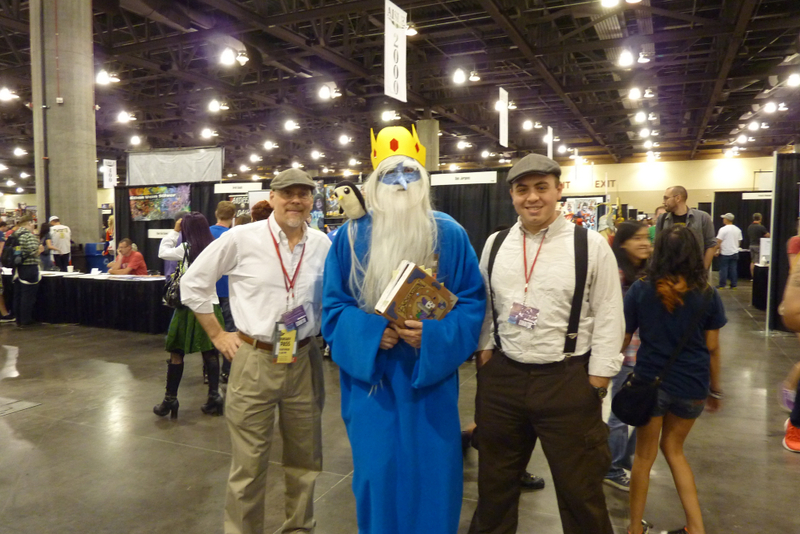 Great Adventure Time cosplay. 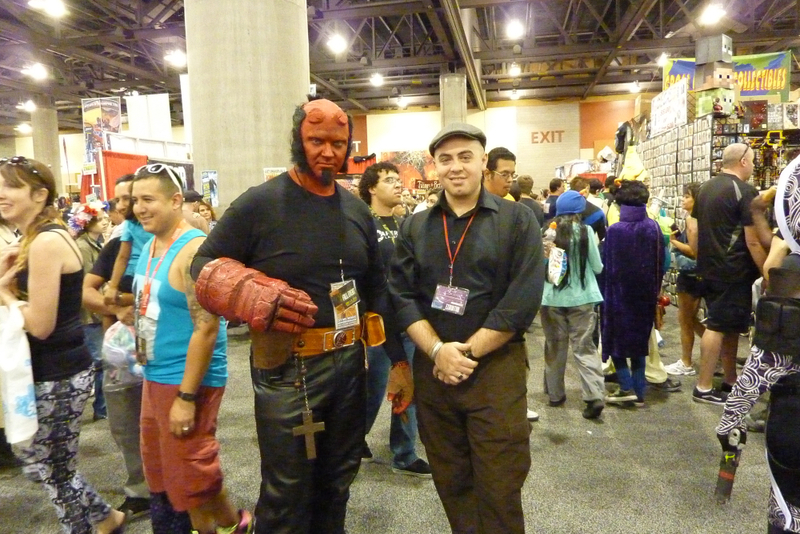 What an amazing Hellboy costume. It must’ve been a lot of work, but it paid off! 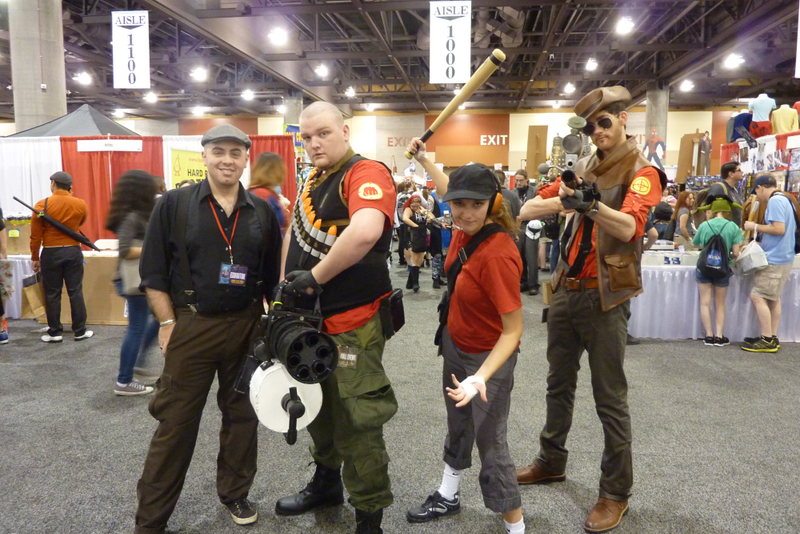 Team Fortress 2 comes alive with the Heavy, Scout and Sniper in attendance, all looking fantastic! Harley and the Mad Hatter were looking fabulous in 19th-century style. The Assassin on the right must’ve kept them in check. HAMMER HARLEY! 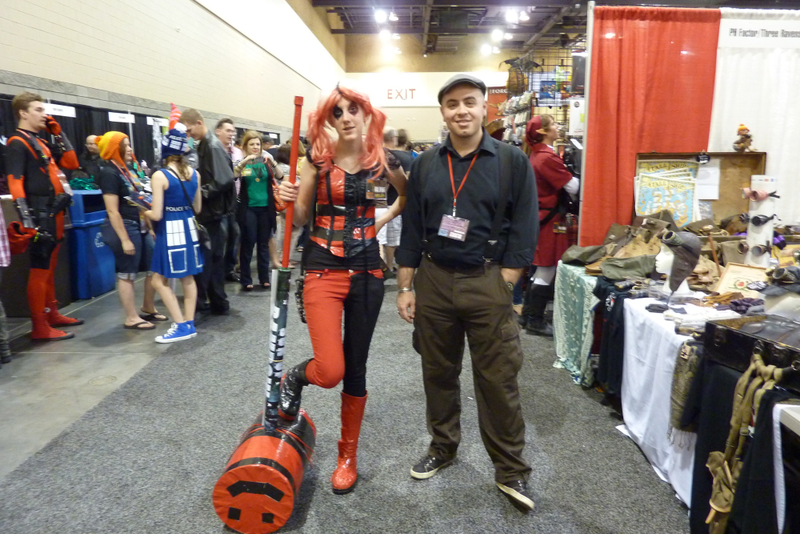 A great costume accessorized with a great prop. Batman had better watch his step. 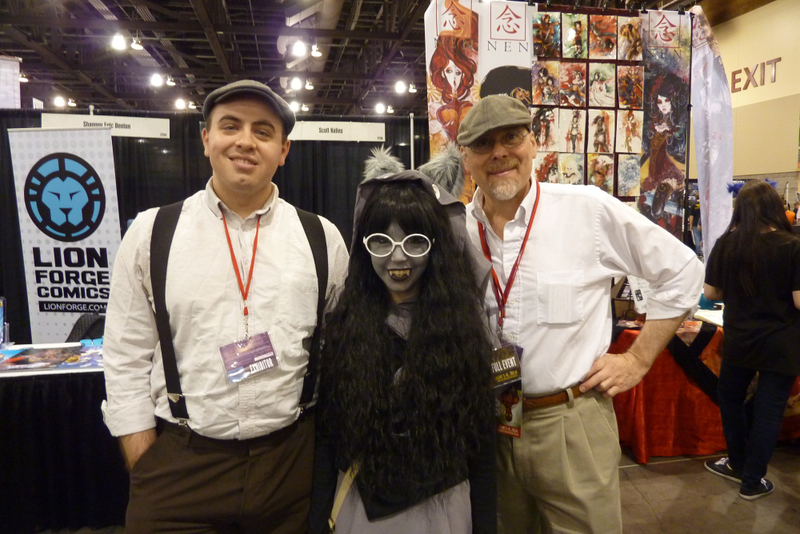 Sadly I don’t know who this character is, but she looked both cute and pretty dangerous! 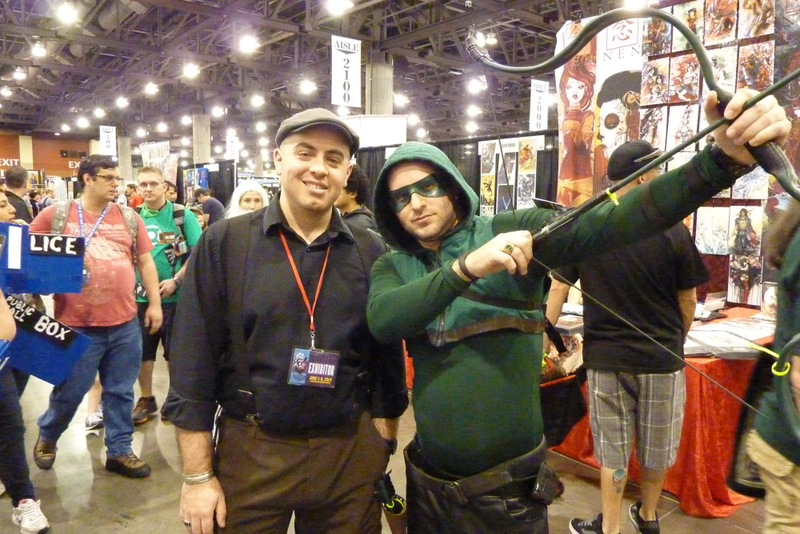 Green Arrow prepares to shoot at an amazing, 20ft-tall death robot that didn’t quite make it in frame. A great costume of a great DC character. Olivia, looking beautiful as always. 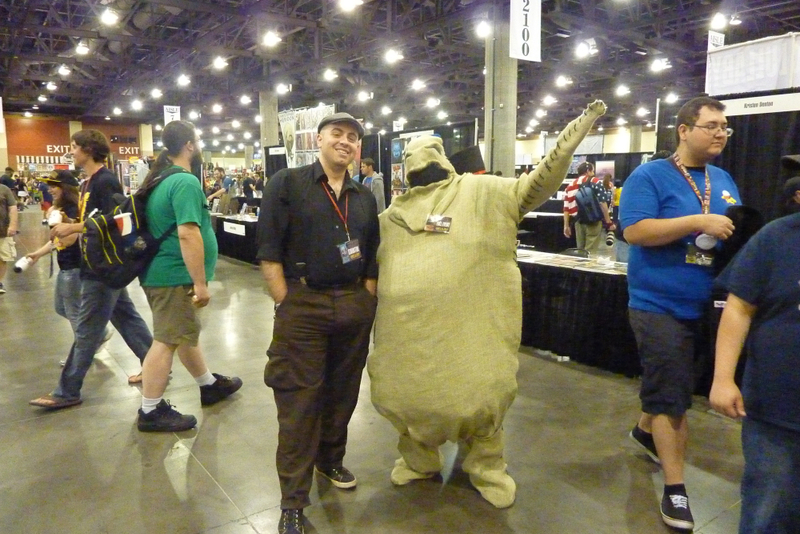 The Oogie Boogie man! One of the best Nightmare Before Christmas Cosplays I’ve seen. 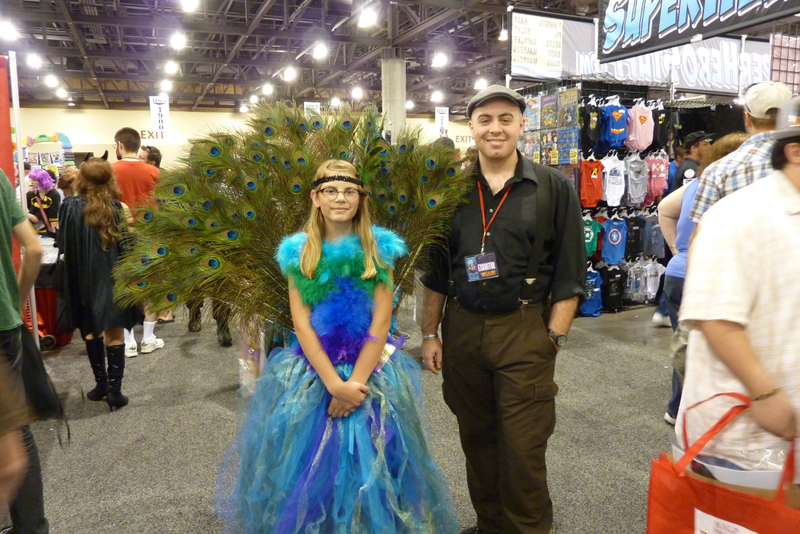 This pretty peacock princess presented a perfectly pleasing personage. Awesome tailfeathers! 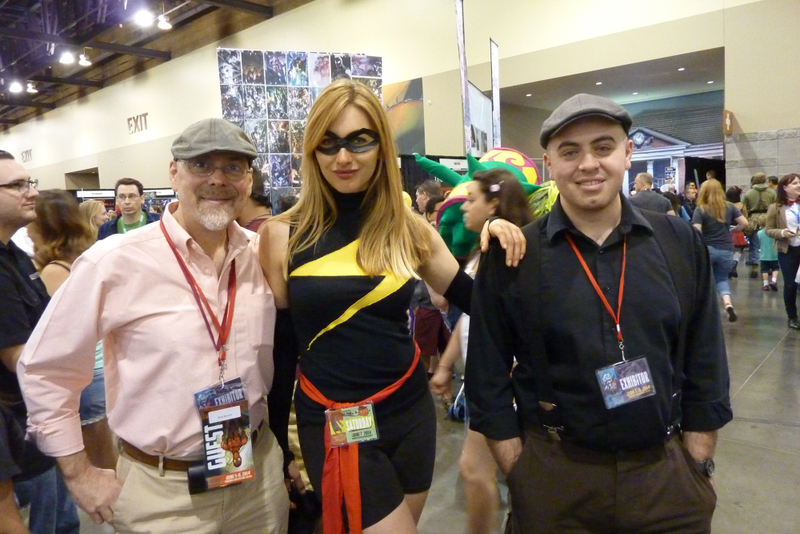 The PHX comic con emblem. One for the history books! 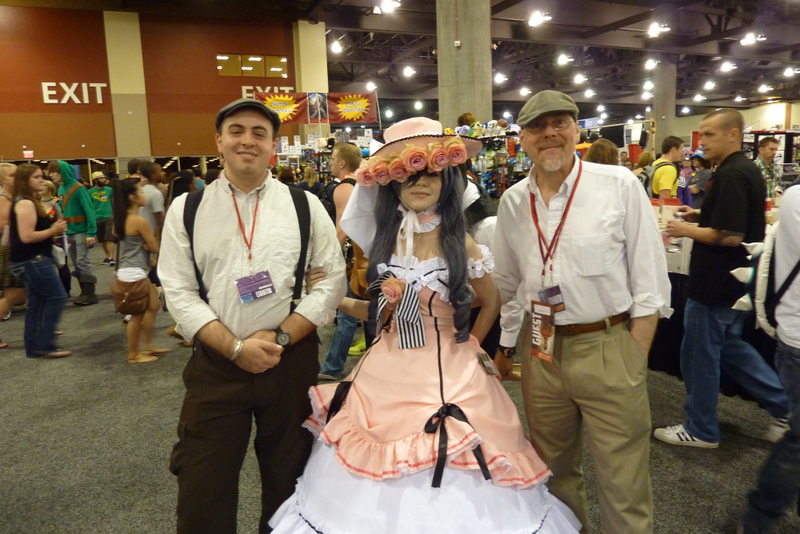 This prim, pink anime cosplay brought an air of sophistication to the convention floor. Poison Ivy, looking mysterious as usual. 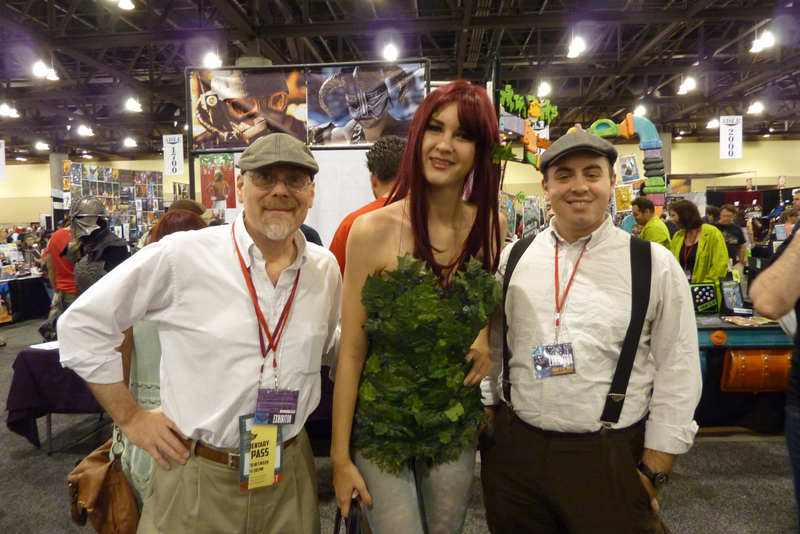 Great job on the leafy corset-piece! 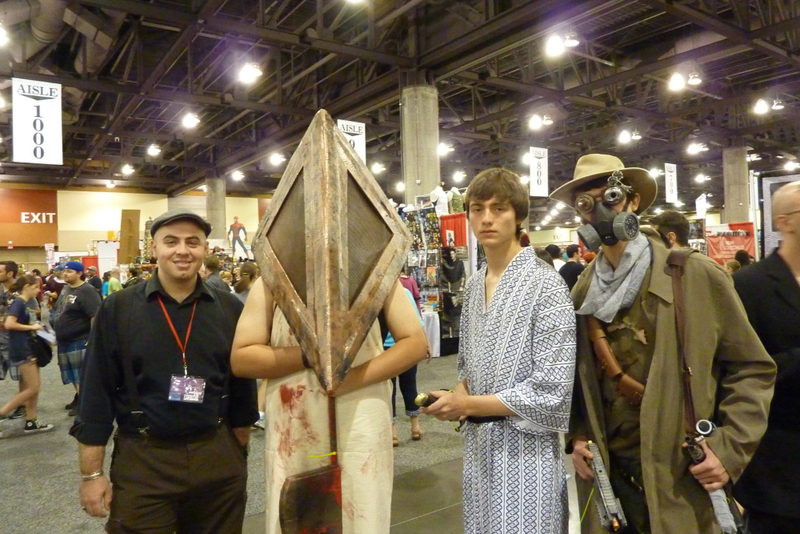 Pyramid Head, a samurai and a steampunk warrior got together for laughs. Everybody needs a day off. 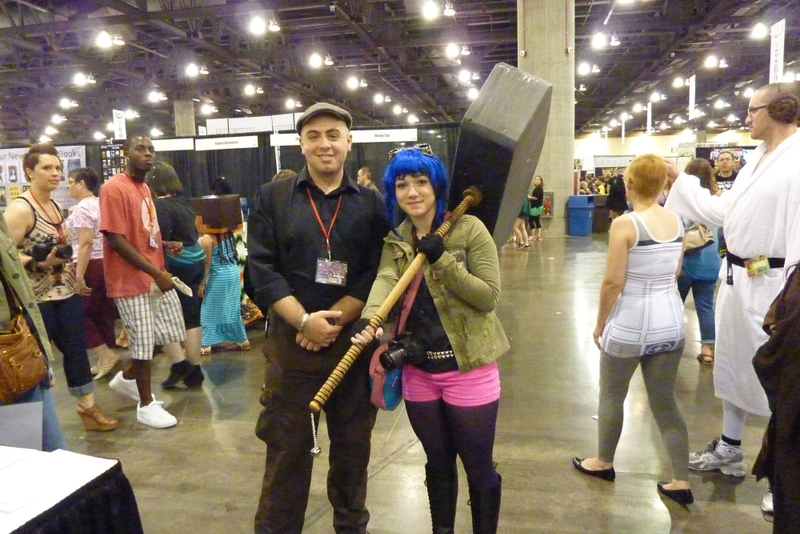 Ramona Flowers from Scott Pilgrim vs. The World! I was really excited to see her big hammer bobbing over the crowd. 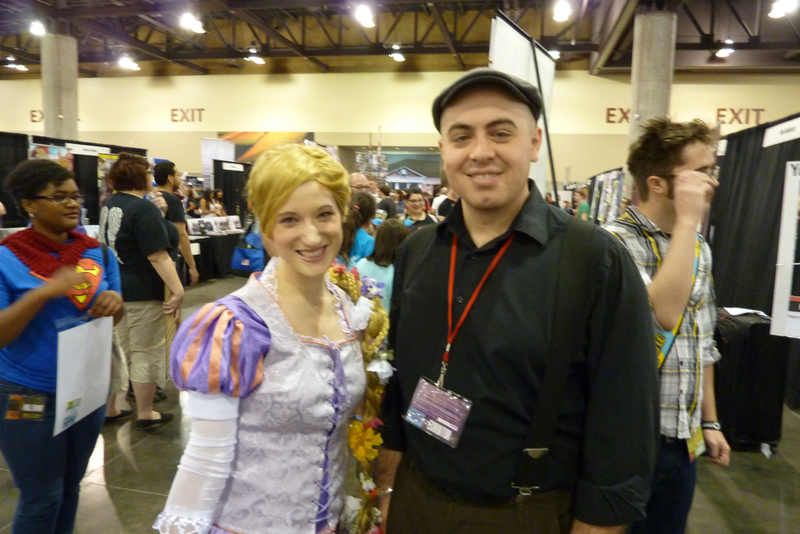 A Cosplay of Disney’s Rapunzel–great job on that elaborate braid!